Police officers, sheriffs and district attorneys do heroic work every day to lock up criminals and keep our streets and neighborhoods safe. Yet many parts of our criminal justice system are broken, and layers of bureaucracy and a thicket of self-serving fees and outdated rules create barriers for people who have already paid their debt to society. Thankfully, in Alabama, a consensus of law-and-order conservatives and left-leaning liberals has begun to reform the system to make sure that justice is served swiftly, but fairly. For people who have served their full sentence, once justice has been done, they should be able to get a job to feed their family, contribute to society, and lessen the chance that they fall back into crime. Senate Bill 163, which the State Senate approved this last week by a 34-0 vote, says that once a person has served their full sentence and paid all restitution, they can petition a judge to obtain an order of limited relief — once obtained, an occupational licensing board or commission is prohibited from automatically denying a certification to someone who has such an order. The board or commission must give the case a fair hearing. This is conservative criminal justice reform that recognizes the dignity of work. Along similar lines, nearly everyone (especially in rural areas) needs a car or truck to get to work and school. Currently, the Alabama Law Enforcement Agency (ALEA) can suspend your driver’s license for failure to pay a traffic fine. That’s an especially harsh penalty for single mothers and the many people who are driving between towns to bus tables at lunch and unload freight at warehouses at night to make ends meet. I have filed SB16 to prevent ALEA from suspending drivers’ licenses if a judge has hard evidence that the person in question is indigent. We shouldn’t take away the ability to work from people over a traffic fine. Working with Governor Kay Ivey and Attorney General Steve Marshall, I have written a bill that will rein in the Board — if SB42 is approved, all Class A felons (these are rapists, murderers, drug kingpins, and human traffickers) will be ineligible for parole until 85% of their sentence or 15 years has been served. The members of the Board of Pardons and Paroles haven’t abided by their own guidelines. This bill, should it become law, will force them to toe the line. The members of the Alabama Board of Pardons and Paroles aren’t doing their jobs. In July, Jimmy O’Neal Spencer was charged with the brutal killings of Martha Dell Reliford, 65, Marie Kitchens Martin, 74, and Martin’s seven-year-old great-grandson, Colton Ryan Lee, in Guntersville. Spencer, a man with a violent rap sheet going back to the early 1980s, had been granted parole by the Board in November of 2017 and released from prison in January. The Spencer case is one among many instances where the Board of Pardons and Paroles has made the wrong call. District attorneys, law enforcement officers and victims of crime are rightfully angry with the Board’s decisions to allow even murderers to go free, including some who have served as little as six years in prison. In some cases, the Board has paroled violent offenders (some of whom had troubling incarceration records) much earlier than its own rules and regulations recommend. That is frightening, and the lackadaisical response from the Board to critics’ questions about Jimmy O’Neal Spencer and other cases is unacceptable. Recent improvements to community supervision programs hold the potential to further improve public safety. I am optimistic that these reforms, paired with the hiring of extra probation and parole officers, will gradually reduce recidivism in Alabama. But the truth is that legislation alone will not solve our criminal justice problems — the policies must be implemented correctly and properly funded to accomplish lasting change. As a State Senator, I am closely watching the response to Governor Ivey’s directive. The Board of Pardons and Paroles must and will be held accountable. The Board has an essential role to play in Alabama’s criminal justice system—but as the case of Jimmy O’Neal Spencer tragically illustrates, errors in judgment by the Board’s members can have catastrophic consequences. No one makes it through life without regrets. The split-second decision we wish we could take back, the risk we never should have taken, the people we failed to prioritize—these are the moments that open our eyes to our need for a fresh start. Unfortunately, not everyone gets a second chance. Right now, there are 22,401 adults in Alabama’s prison system. Ninety percent or more of these men and women will be released after paying their debt to society. When they are, they will find second chances hard to come by. This is not only an issue in Alabama. It is estimated that 65 million Americans—or one in four adults—have a criminal record. Everyone makes mistakes in life, so each of us deserves a second chance. That’s why our legislature resolved that April would be Second Chance Month in Alabama. This resolution is another step in the effort to reform our prison system. It’s time for our state to begin removing unnecessary barriers for people who have paid for their crimes. The Council of State Governments has found that returning citizens face more than 48,000 legal barriers to housing, education, employment, and more. Shouldn’t we want people to get a job and become law abiding taxpaying citizens? Preventing former inmates from getting a job just doesn’t make sense. Then there’s the long shadow of a criminal record. Men and women who have a criminal record face social stigma from others in their communities, and the shame associated with spending time in prison. They have a difficult time finding a place to live, getting a driver’s license, or insuring a vehicle. Many businesses write off an applicant with criminal background regardless of whether they have paid their debt and done everything that has been asked of them. Christians believe in loving their neighbors by treating them the way we would wish to be treated ourselves. If you faced rebuilding a life, including your career and relationships, you would want someone to offer you a second chance—not because they pity you, but because they value you as a fellow person. Jesus didn’t turn anyone away, no matter what bad decisions they had made in the past. We can learn from that lesson. It’s harder to extend love and chances to people when they have fallen, but the reality is we have all fallen in different ways. Alabama is ready to start unlocking second chances for people with a criminal record, because our state’s citizens understand the costs of a high recidivism rate. If we truly want to lower our recidivism and crime rates, let’s give people a fair opportunity to get back on their feet. It’s much cheaper to help someone find a job than to reincarcerate them. Remember, the vast majority of incarcerated men and women in our state will be released. Unlocking second chances saves taxpayers money and reduces the recidivism rate by keeping men and women out of prison, stimulates the economy by getting former prisoners back to work, and develops safer, flourishing communities. Let’s build a culture of second chances in Alabama that reflects the God-given dignity and potential of all individuals. State Sen. Cam Ward is a Republican from Alabaster. We’ve heard and seen it all over the past several months since the Legislature first came to order in early March. Since that time, there has been a regular session and two special sessions. Throughout each, a lot of ideas were bounced off the wall – some stuck, some got shot down, and some still have legs. Yet, there are still grave fiscal challenges ahead for Alabama. The growing number of senior citizens in our state means the cost of the Medicaid program will continue to rise over the coming decade. Even now, Medicaid consumes 37% of the state’s General Fund budget, which funds all non-education expenses. For Alabama to thrive in the coming decade, the Legislature must have flexibility to allocate state tax dollars in the most efficient manner possible. Currently, 91% of Alabama’s tax dollars are earmarked for specific departments or programs. Alabama has the highest percentage of earmarked revenue in the nation, and the next highest is Michigan with only 63%. The national average is just 24%. That means Alabama has nearly four-times the earmarks of the average state. Earmarking leads to apathy in state government since state agencies are assured specific sources of funding, and there isn’t incentive to show they are using current funds efficiently. Bureaucrats can rest easy in the knowledge that a stream of taxpayer dollars is earmarked just for their programs. Both excessive debt and high levels of taxation will mire an economy in sluggish growth. Republicans in the Legislature have stood firm against the Governor’s calls for massive, broad-based tax hikes. Yet, the challenge of fully funding essential programs like Pre-K for our children and Medicaid for the elderly can only be met if the Legislature has the flexibility to move funds on an as-needed basis. For Alabama to continue to afford the low tax rates we enjoy, the Legislature needs additional flexibility to more smartly allocate existing resources. That’s exactly why we need this un-earmarking bill to pass in the 2016 legislative session. 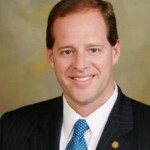 State Senator Cam Ward (R-Alabaster) is Chairman of the Senate Judiciary Committee and Chairman of the Prison Reform Task Force. Right now, Alabama is on track to solve one of the biggest threats to its budget and autonomy: our state criminal justice system. You may not know its full significance. We have spent the last decade unable to deal with increasing burdens on our state prisons. Our facilities hold almost twice the number of inmates they were designed to hold. The level of overcrowding in our prisons is a sign that criminal offenders have overwhelmed our capacity to manage their sentences and effectively punish them. Further, it is a sure sign we are unable to keep tabs on them all post-release. The problem is giving Alabama national attention of the worst kind. We take action, or face a federal takeover of our corrections system. of control over spending, over sentencing and even over release dates of prisoners. In short, the federal government will decide who walks free and when. Our current system means our communities are simply not safe enough. None of us takes public safety lightly. Yet Alabama’s crowded prisons are not a sign of successfully punishing law-breakers. Instead, they are proof of a flawed system and a compromised fight on crime. The idea behind much of the prison reform package is to invest greatly in supervision of people coming out of prison — an approach that has drastically reduced reoffending in other states. Fewer re-offenses mean fewer victims and lower crime rates in our communities. That’s a public-safety commitment that works on all fronts. The proposed reform is a product of a long and careful process. This legislation is built on a bedrock of research led by Alabama’s stakeholders in our system of criminal justice and corrections. Months of thorough research and contemplation by the Prison Reform Task Force revealed that Alabama can actually reduce its crowding without resorting to drastic measures. This legislation is the first, necessary step. Every stakeholder, from branches of law enforcement to victims’ groups, helped to shape the legislation. Our new path is built on accountability. Anyone sentenced to prison in Alabama would be supervised, with speedy and unavoidable sanctions that would dissuade people from reoffending. Using supervision with more meaningful resources aims to hold offenders themselves accountable for their behavior. The concepts underlying the legislation have proven successful in other states and Alabama stakeholders – the state and local officials who will be tasked with carrying out the new policies – have used their practical expertise to formulate proposals to effectuate the necessary reform. In closing, I want to reiterate that the flaws in our current system are fundamental and comprehensive, not attributable to any one person or policy. The problem we are facing is not our fault. However, as leaders of this state, we must be honest about the increasing financial threat to our state budget, as well as the risk to our ability to fight crime our way. If we fail to begin addressing these issues now while we have the chance, the crisis ahead of us will indeed be our responsibility. I have the pleasure of serving as Vice Chairman of the National Conference of State Legislatures’ Energy and Natural Resources Committee. Supreme Court Justice Louis Brandeis once said that states are The Laboratories of Democracy – the good ideas of governance come from the state level, and then are often adopted nationwide if proven to work. My experience with the NCSL Energy Task Force certainly bares this out. This week as the Chairman of the Alabama Senate Energy Committee, I was in Washington, DC with colleagues from across the nation, working on a document regarding management and usage of America’s energy supply. While sometimes these types of things tend to get off in the weeds of minutiae, there is much good news for our state and country when it comes to energy. Alabama ranks 13th in Energy production, and has the highest percentage of “mix” in base load production of any southeastern state. That’s a fancy way of saying we’re in the top 25% of energy producing states, and we get our energy from a diverse set of fuels: hydro-electric, nuclear, coal and renewables. Each one of the industries creates jobs for our state, and each receives industry-specific tax incentives to ensure lower consumer costs, and higher worker retention rates. What we do in Alabama has an effect on the national energy situation, just as what is done in North Dakota, Wyoming, Texas, Oklahoma and even California has an effect on the national energy production picture. North Dakota has the Bakken Oil Fields, which has transformed their economy, and is altering the worldwide balance in oil production. Wyoming and other western states are producing more and cheaper coal and natural gas through a variety of new technologies. Oklahoma and North Texas are taking advantage of their wide-open spaces, and are at the forefront of wind turbine production. Even “Governor Moonbeam” out in California has approved of legislation establishing a permitting system for hydraulic fracturing oil exploration. Every bit of this is a boon not only to the United States’ economic outlook, but also our foreign policy. In 5 years we will be a net energy producer, and exporter – something that has not happened in over 40 years. I am proud to represent our state on such a vital and cutting edge taskforce that will have long-term policy indications for our country in the years to come. Energy production will be the next big issues to confront state governments and Alabama needs to be a leader in this area. Cam Ward represents Alabama’s 14th district in the State Senate, where he is co-chairman of the Energy and Natural Resources Committee and chairman of the Judiciary Committee. He can be reached through his website, CamWard.com. Before this session, my fellow legislators and I understood that our state faced a financial reckoning – especially in terms of the General Fund Budget – which funds all non-Education spending in our state. Vital programs instrumental to the daily lives of Alabama’s citizens are being cut to the bone – and then filleted even further because of the financial realities of state budgeting during the continuing and interminable Great Recession. As Senate Judiciary Committee Chairman, I began thinking about ways to apply a conservative, pro-business and small government philosophy to our courts and our entire judicial system. Alabama cannot continue funding agencies like the Administrative Office of Courts, Department of Corrections, Department of Public Safety and the symbiotic agencies that maintain law and order in our states at the same rates that we did during boom times. Nor can we afford to allow court cases to languish, prisoners to be released and police officers and highway patrolmen to be laid off. Faced with this Gordian Knot of adequate funding or endangering our citizenry, we came up with a series of legislation that allowed us to cut the costs of these agencies while maintaining the level of services our citizens expect and deserve, and not putting our citizens in harm’s way. Not all of these bills are perfect, nor are they all original. I feel that it is always better to try to do something and achieve part of it then stand on ceremony and achieve nothing. I also believe that many of my colleagues around the country have had a chance to implement and study best practices-type legislation that provided us a road map to work from. Chief among the legislation that I have proposed, sponsored and are in various stages of being passed by the legislature and forwarded to Governor Bentley for his signature are Sentencing Reform, Private Judges, Expedited Litigation for cases under $100,000 and Cyber Crimes Legislation – all of which seek to modernize our laws and streamline the processes of our judicial system while allowing our state and our citizens access to justice and due process under the law. The Sentencing Reform bill has passed the senate and is expected to move through the house before Sine Die. It comes after numerous attempts over the past several years to tackle this issue. They overcomplicated the issue and it was killed because it tried to be all things to all people. We took the examples of Virginia and Texas and our reforms will result in truth in sentencing for violent offenders, while allowing judges several options in how to punish non-violent offenders while pushing them to stay employed and be productive citizens. It will also avoid the widespread release of dangerous criminals back into Alabama’s communities like California did – which is something no state can afford, no matter what their budget problems. The Private Judges Bill, sponsored in the Senate by myself, Senator Tom Whatley and Senator Jerry Fielding – two lawyers and a former judge – and in the House by Rep. Mike Jones has passed both houses of the Legislature and is awaiting Governor Bentley’s signature. It would allow two parties involved in a lawsuit to agree to pay for a judge to hear their case immediately at no expense to the state. There are, of course, guidelines for the judges appointed in these disputes: they must have 6 years on the bench and be in good standing with the bar and all continuing legal education requirements up to date. Another example of outside the box thinking that will allow citizens and companies involved in a civil suit where damages are less than $100,000 to have a shortened litigation process. The lynch pin to this process was requiring that the discovery process in these cases was required to be cut in half. When this legislation was enacted in Texas it greatly shortened the period of time it took to have case decided in court. This has the dual effect of shortening court dockets for our already overburdened court systems, and brings money into state coffers. The Cyber Crime legislation, sponsored by myself and Rep. Paul DeMarco, will bring Alabama’s code dealing with computer and internet-based crimes into the twenty first century. Modernizing these laws will protect Alabama’s citizens and companies from internet predators and sophisticated thieves while providing our law enforcement agencies with the tools they need to prosecute these criminals. The main emphasis with each of these bills is not solely to save money for the state, or to try to privatize functions or emphasize a conservative governing philosophy – it is to do all three. These are all good pieces of legislation that are right for our state no matter the time – but as we all know sometimes it takes a crisis to get truly creative and come together to solve problems. I believe my colleagues in the Legislative, Executive and Judicial branches have done this – and I commend them for their help and leadership on these issues. When most state laws dealing with computers were first written, the average Alabama family did not have a home computer. These laws focused on protecting the physical components of computers, and not the valuable personal information families and businesses use on a daily basis to access their bank accounts and other platforms that have become ingrained in the fabric of our lives in the new digital world where we all now live. When I was first elected to the state house, we did not have computers in every office, and many of our bills were still being manually inputted in a typing pool. Now, when I have changes necessary to legislation, I can send an email from my iPad with the changes highlighted – provided my daughter isn’t using it to play Angry Birds or Temple Run. Senate Bill 356 is an important piece of legislation that will provide added protection for our families and businesses who are being put at risk by cyber criminals, internet bullies, and all manner of bad actors – both in our state and around the world. This bill will put Alabama on the leading edge with remedies allowing law enforcement to obtain subpoenas and search warrants for information held by out-of-state providers such as Facebook and Twitter and network providers like AT&T and Verizon. The bill also allows for Alabama Judges and Prosecutors to issue warrants for information held by these specialized companies, and for Alabama companies to honor the same warrants coming from out of state law enforcement. As you know, many crimes are committed where the vital evidence in solving the crime involves information from computers – this law will aid our law enforcement in tracking down criminals throughout the country. Many of the worst “cyber” crimes are actually committed over the computer – by people seeking to take advantage of Alabama citizens. These crimes include industry terms such as “phishing” and “skimming” – but let’s call it what it is: criminals stealing your personal or business information, to steal your money, your identity, or get credit cards issued on your accounts in their names. Many of the programs and devices used to commit these crimes have no legal use. I’ll say that again: these devices were designed for criminal activity, and this bill let’s our police and investigators seize and destroy this equipment. The world we live in is enhanced by technology. It makes our businesses more efficient, it allows us to stay in touch with friends and relatives more easily; it can also be a disaster. The reason I sponsored Senate Bill 356 is to make sure that while Alabama is becoming more and more ingrained in our wired world, that all of our citizens are protected against those who wish to do us harm.